Make Monday a relaxing and fun day at Fair Go Casino with a 150% bonus and 40 free spins on the new Gemtopia pokie! Redeem the coupon code DOD-150-GEM before your next Monday deposit of $20 or more to claim your bonus to play your favorite pokies. You can also play the Triple Twister game with the 30 free spins coupon LUCKY-TWISTER, but do not claim two no deposit bonuses in a row. February depositors can also claim a $25 free chip loyalty bonus with the coupon code LUCKYFEB25. While you are it, try a few spins on the new Wu Zetian pokie or shoot some fish in the new multiplayer shooting game Fish Catch game. Good luck! 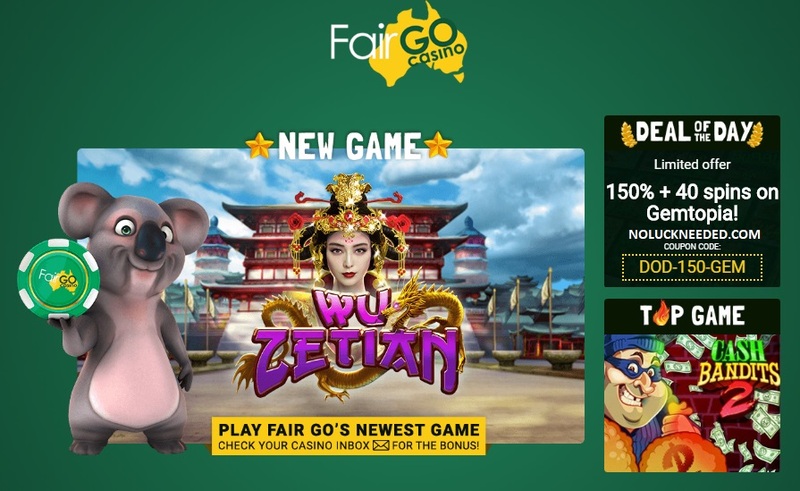 $5 Free Chip for New Players: Register your new Fair Go Casino account after clicking the banner below and then redeem the coupon code FAIRGO5 in the coupon section of the casino cashier to claim your $5 free chip, no deposit required bonus. Please read the bonus terms and conditions on the casino’s website before you play. No Maximum Cashout! AUD$20 Minimum Deposit. Bonus terms apply, please check the casino’s website for details. Deposit $50 – Play with $75; Deposit $100 – Play with $175; Deposit $200 – Play with $400! No Maximum Cashout! AUD$50 Minimum Deposit. Bonus terms apply, please check the casino’s website for details. 30x wagering. $10 is the maximum bet unless specifically stated otherwise. Please note that bets placed on Roulette on colour Red and Black are not allowed, if contrarily any winnings generated will be voided. Also bets placed on European Roulette with an active bonus are not allowed. Valid ALL DAY EVERY MONDAY. Claim your Gemtopia Pokie Free Spins and Monday Coupon Codes at Fair Go Casino!